I've been playing with my vanilla cookie recipe, trying to get it just right - my husband and I don't like the traditional buttery sugar cookies. So I had a whole batch of cookies, in random shapes, sitting there, just begging to be iced, I just wasn't sure what to do with them. Then I got out my trays, the ones I always do my decorating on, and inspiration struck. Don't you just love the colours, and the polka dots? I started off with lots of wet-on-wet polka dot bases, most of which I didn't end up using (who knew how hard it would be to do polka dots in straight lines?) then moved on to some paisleys, I love paisleys. 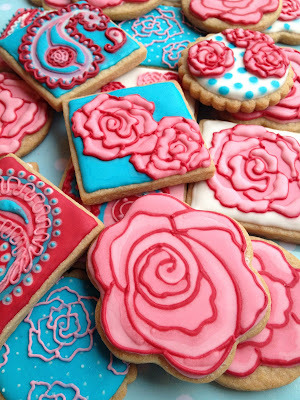 But when I got to the flower shaped cookies, they just weren't looking right, so I decided to ignore the daisy shape and do a rose instead. They looked great! 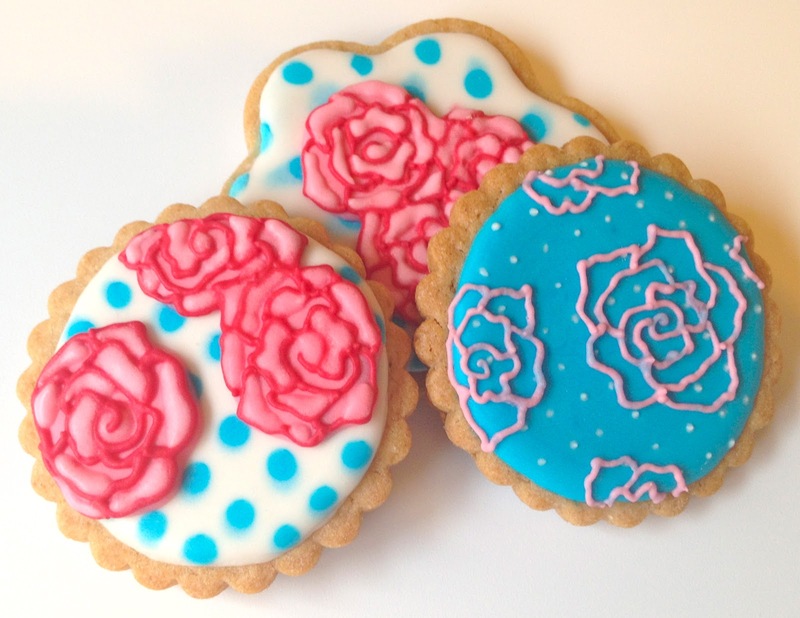 Before I knew it, there were roses on almost all of my cookies! I guess I had some of Arty McGoo's recent cookies in the back of my mind, because some of mine definitely resemble hers - thanks Liz! 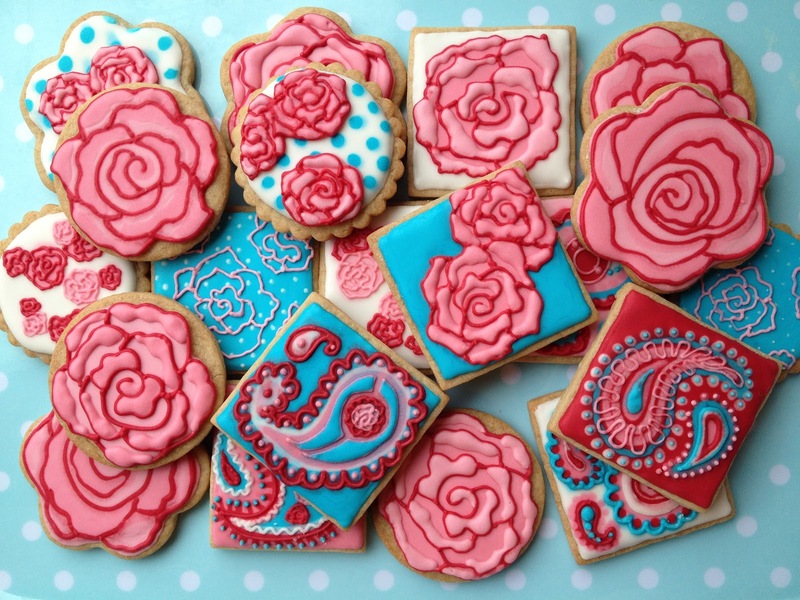 Click here for a tutorial on icing your own rose cookies. Those paisley ones are amazing. How long does it take you to ice one cookie?? So talented. Hard to say, because I do a little on one, then set it aside to harden, work on a few others, then go back for the next layer. Probably around 2-7 minutes each, depending on how detailed they are. 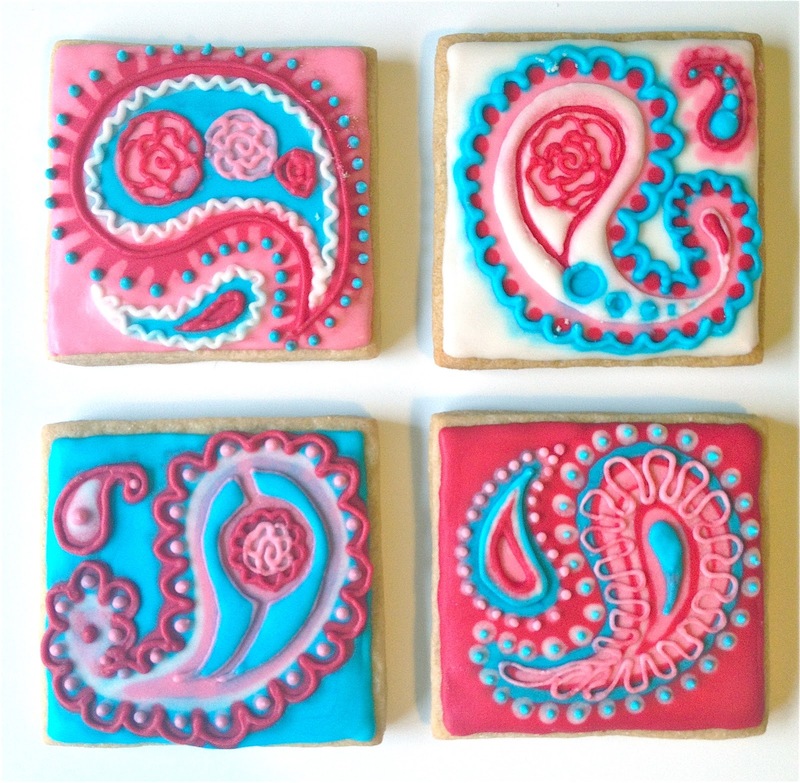 I am getting faster and faster though, my first few cookies took much longer, and didn't look very good! Love the colors! Your cookies are so pretty, looking forward to the tutorial. Thanks Janet! They are great colours, aren't they? The tutorial will hopefully be up tomorrow. Oh wow! The roses look even better with the blue as well. What a lovely set of cookies. Thank you Helen, they were fun to make. OOh, I love the colors and different desigins!! So pretty! And I love the cute polka-dot trays too! I just stumbled across these and "gasp!" They are breathtaking! Beautiful designs and what a palette! Great eye. These are very pretty! I love the colors!